Cardinal Newman High School scooped the cup! Pupils from across Lanarkshire have teamed up with the police and anti-sectarian campaigners to help ‘Kiss Bigotry Goodbye’ once and for all. 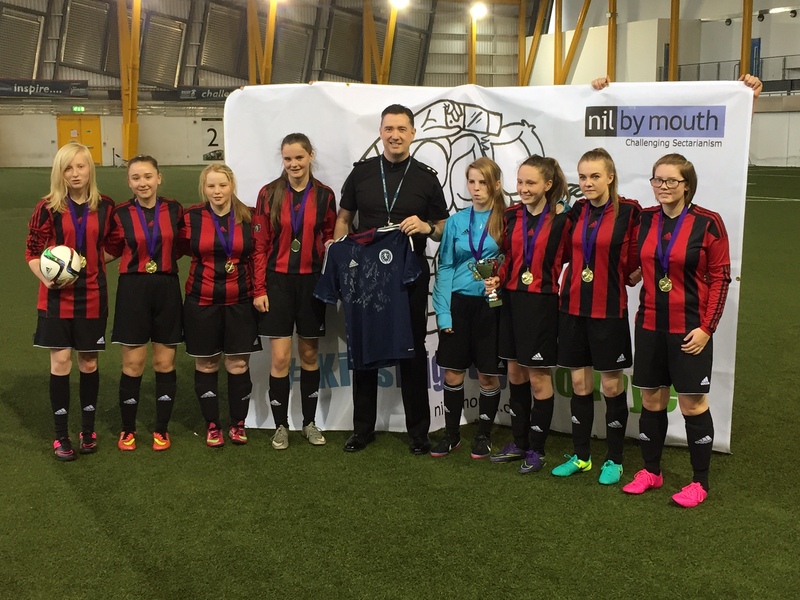 Female footballers from eight Lanarkshire schools will compete in the first ‘Kiss Bigotry Goodbye’ Cup at Ravenscraig Sports Centre in conjunction with Police Scotland and charity Nil by Mouth. The Kiss Bigotry Goodbye campaign was launched by Nil by Mouth last summer and hundreds of people have taken part in events including quiz nights, school sports activities, penalty kick competitions and online campaigns encouraging fans to post images of what makes them love the game. The charity was set up by Glasgow teenager Cara Henderson in response to the brutal sectarian murder of her school friend Mark Scott as he made his way home from a football match in Glasgow in 1995. It was also confirmed at the event that Nil by Mouth has being awarded £85,000 by the Scottish Government to run its education packages in workplace, schools, colleges and universities across Scotland during 2016/17. “This event is hugely significant as it shows football as a positive vehicle for change and proves the game can bring people together rather than being used as a dividing line between communities. Education is key to challenging prejudice and it’s great to see Police Scotland investing time and effort in grassroots programmes like this which provide a safe and positive environment for pupils to mix. We have worked with these eights schools over a number of years and we have seen many new friendships form in that time. That is why we are delighted that the Scottish Government have today announced funding that will allow us to continue to build relationships and understanding between people. In a week where we have seen such darkness and sadness the message we want pupils to take from today is that difference is something to be celebrated, not feared. Our charity was set up by a teenager and we know the potential of young people to change the world. “I would like to wish all of the competitors in the inaugural Kiss Bigotry Goodbye Cup all the best.